Audrey at our 2002 Doll Show! New for 2009 - Audrey did not participate in Idex this year but we will keep you up to date. We are thrilled that Audrey attended our doll show this year in October. 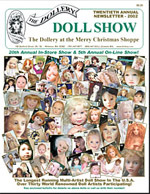 Be sure to email Kim at kmalone@dollery.com to get a free copy of our 24 page full color doll show catalogue highlighting Audrey's new work. 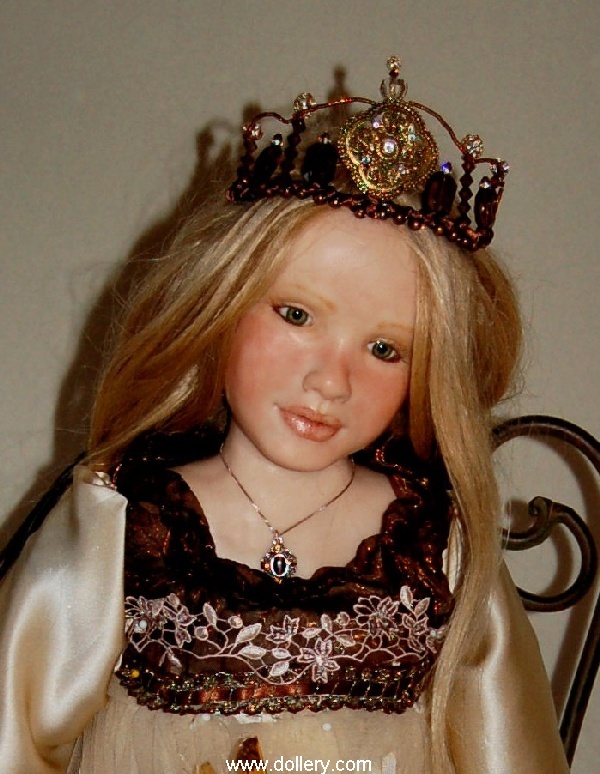 We have posted "Her Royal Highness" shown below that was just completed for our Oct 2008 show among others. She is currently available. 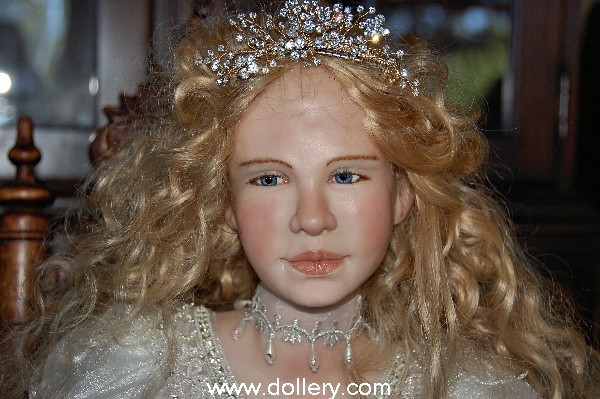 Audrey Swarz at our 26th Doll Show! One of a Kind, polymer clay with cloth and armature. Green hand blown glass eyes, blond human hair, 36" if standing. 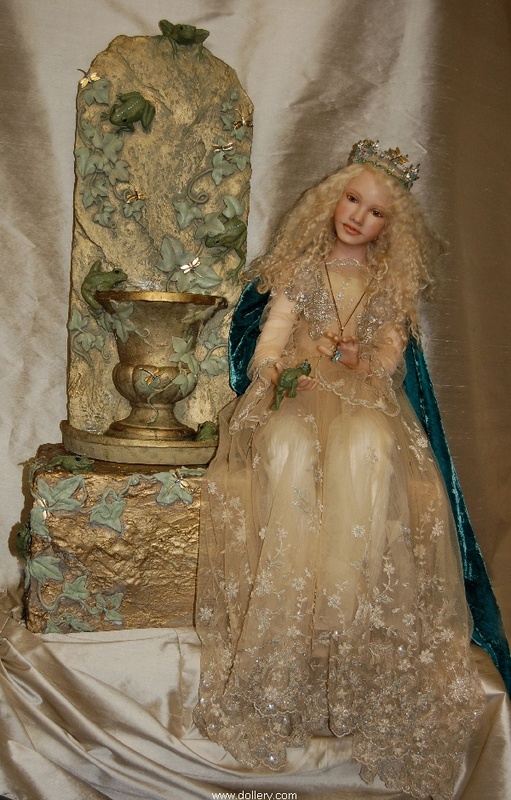 Little fairy is 8"
The dress she wears is made from beads, silk netting, imported hand beaded silk fabric and velvet. All in beautiful tones of rich browns and cream colors. This fabric has to be seen in person to really show it's true beauty. The beading is magnificent to say the least. The tiara is artist created from imported beads and crystals. Just beautiful from head to toe.....magical. She sits in a garden chair that has a pillow the artist made from hand dyed silk velvet in gold/brown and trimmed in gold. Very regal. She holds a tiny fairy she found in the nest resting in this beautiful bird bath, wrapped in fine fabrics as a cocoon to keep the fairy warm. One of a Kind sculpt from polymer clay. Green glass eyes. 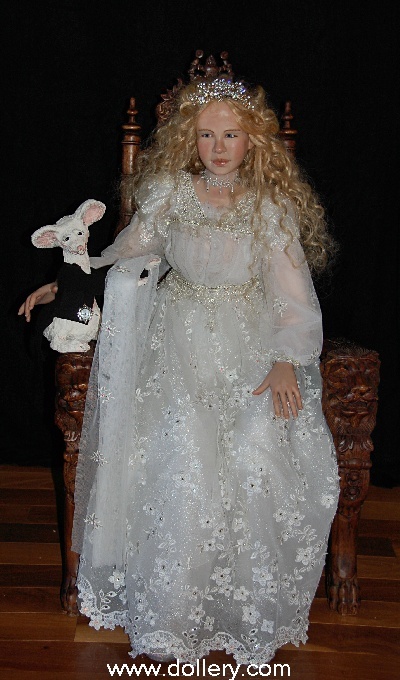 Blonde angora mohair wig. The frog princess would be approximately 30 inches tall if she were standing. The entire measurement of this piece from the bottom of the base to the top of the fountain where one frog sits measures 30 inches tall. The fountain is painted with many washes of gold tones. The frogs are epoxy clay with Swarovki crystals stripped down each of their backs. The gold dragonflies throughout this piece have Swarvoski AB crystals and teal color crystals. The fountain was created to give the feel of old world charm. There is fake water in the fountain so the frogs have some to play in and to sip on! 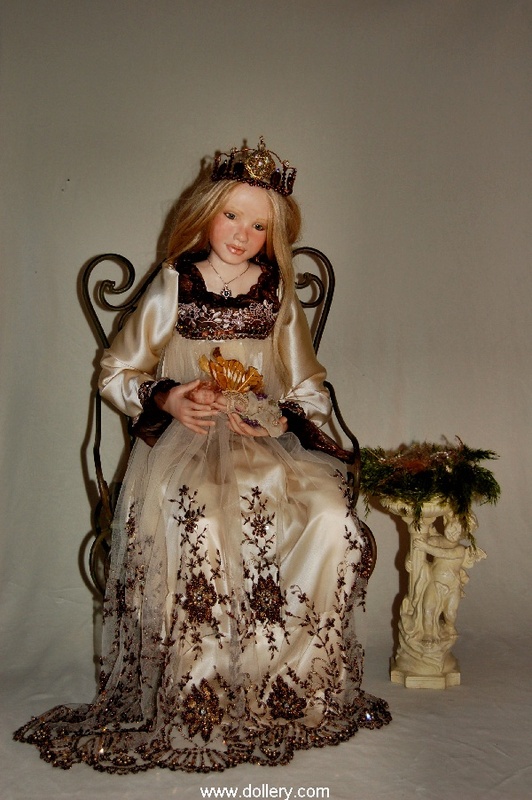 The frog princess wears her royal dress made from imported silks and lace. All of which is adorned with incredible details of beading, crystals and metallic threads. Her cape is made from hand dyed teal color silk velvet. The crown she wears was made from many beautiful Swarovski crystals to match her dress. This entire piece was created by the artist alone. One of a Kind, 38", Polymer Clay with cloth and armature. Blue hand blown glass eyes and blond human hair. Cinderella comes complete with her hand carved solid mahogany chair. She also comes with her one of a kind mouse made of paper clay. He is dressed in a tiny wool tux with tails. Cinderella wears many different types of wonderful silk within her dress. Her dress is very detailed in design. It is delicately embellished with hundreds of Swarovski crystals. Each on e put on her dress by Audrey. On the top of her dress and also at her waist and wrists are imported beading and crystals which make her dress almost glow! Her blond human hair is curled. She wears a Swarovski crystal tiara that shines brilliantly. The slippers are decorated with crystals and glitter. Older Dolls (below) still available. Beautiful blue glass eyes and angora mohair bearding. Santa measures 31" tall and with the Elf on his shoulders the total piece is 37" tall. Santa is wearing his artist created velvet suit in deep Burgandy lined in gold silk. Trimmed in lambs' wool. The antique sewing machine is adorable. Black leather boots & belt. 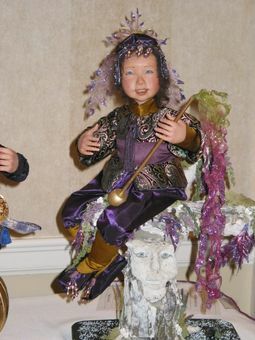 The Elf is dress in jewel tone tapestry knickers, wood Burgandy vest trimmed with gold tassels. Blue glass eyes and light auburn mohair wig. Deep green and Burgandy wool artist made elf shoes. Gold stars adorn his hat made of matching jewel tones. Gold fabric covers the wood base and it is trimmed with gold ribbon trim. 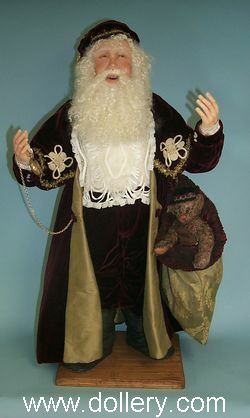 Santa holds an antique knitted German doll. The bear that the Elf is holding is just a temporary and will be a different bear. 1/k with pedestal it stands about 24"
See more pictures and better description below. 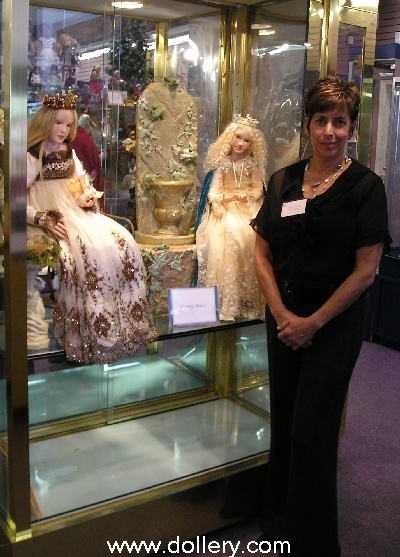 Audrey Swarz at our 2005 Doll Show! 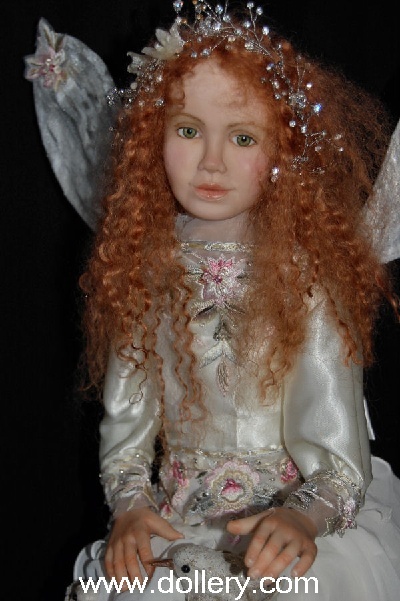 $1,600, One of a Kind Fairy. 28" tall (Not shown here) - introduced at our last show. Sitting on a gold painted plaster pedestal. This fairy wears wonderful imported fabrics of tans and teal colors. Gold silk underlay. She wears an incredibly whimsical hat made of matching lace beded fabric. 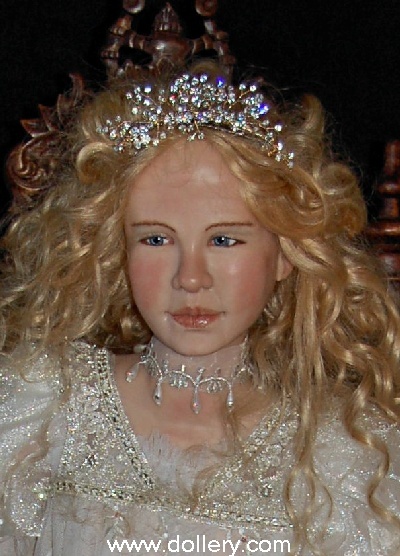 Her eyes are green glass, her mohair wig is blond. Artist-made wings created from imported papers and metal leafing technique. Her shoes are delicate and created to match her costume. 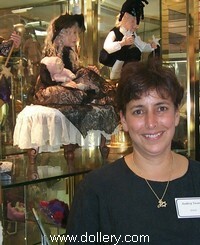 Audrey Swarz reluctantly posing at our 2004 Doll Show! Cernit with cloth and armature. Blue Masterpiece Glass Eyes, Blonde Mohair. 24 inches in a seated position. Ellie is sitting by her vintage dresser with hat boxes surrounding her and a collection of red hats with purple accents. Ellie loves being a member of the Red Hat Society., Her dress is purple silk and detailed with vintage lace antique trims that match. She wears a red felt hat with feathers and a red hat logo pin attached. She comes complete with her dresser which will be loaded with antique treasures. Sitting on a wood chair next to her wonderful embossed dresser. The mirror and perfume bottle are Belladonna pieces with beautiful Swarovski crystals. The frame holds a picture of her love. The purple velvet trinket box is also adorned with crystals, it opens to hold treasures! A hat stand holds another hand made hat that was created just for her in purple with red velvet lining. Her costume is designed from immported fabrics in colors of purple and her hat is red. The skirt fabric is a wonderful chiffon with sequins and hand painted. It is incredible. Detailed with black antiaque lace and resin cast purple shoes. 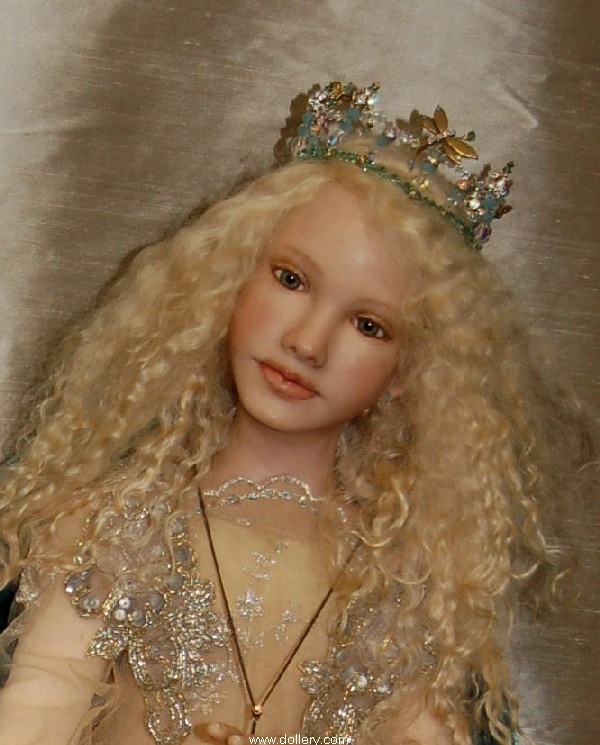 Her eyes are blue glass and her hair is blond angora mohair. The details of her hands include individually applied fingernails. Never to eccentric! One of a kind scuplted from Prosculpt. 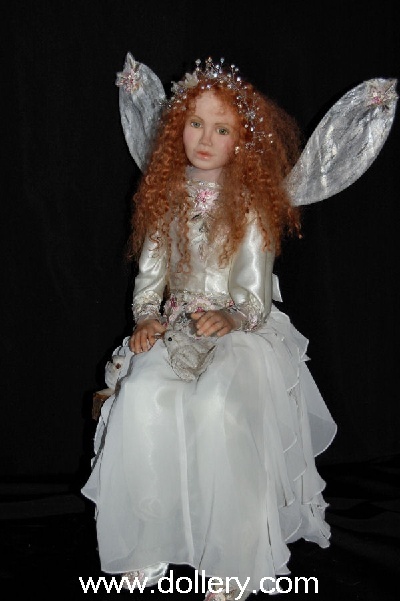 The doll measures 20 inches in her sitting position. The green velvet sofa measures 20 inches wide by 11 and 1/2 inches tal.l. A glass wine bottle sits on top of a silver etched tray. Audrey holds a wine glass and beckons you to join her! The beaded purse was hand knit on size 000 needles and made just for her. The outfit is created from antique black and off white fabrics and lace. It is tattered and old and her favorite outfit to wear! The flowers attached to her dress and in her hat are handmade from beautiful ribbons and beads, in gold and peach shades. The shoes are cast in resin and hand painted in shades to match her outfit. This lady knows how to have a great time and will never get old! Glass brown eyes and red hair! mmmm This Audrey could be the future Audrey Swarz . . .Need I say more??? Santa sitting on his stool measures 25 and 1/2 inches tall in his sitting position. 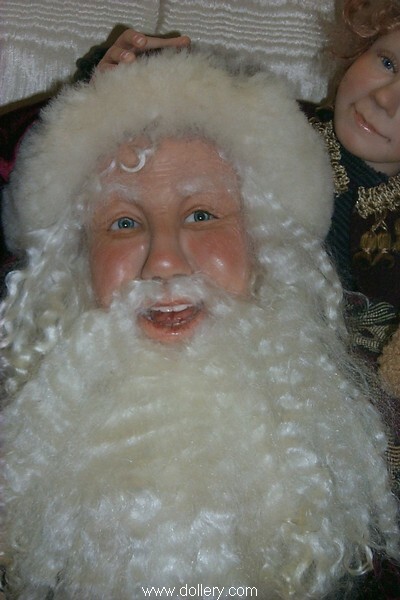 This Santa has a twinkle in his blue glass eyes. His hair and beard is silky angora mohair. His pants are burgundy silk velvet. The sweater is hand knit from burgundy tweed silk. White cotton shirt and black artist made leather boots. Santa holds a beautiful pocket watch that works to hold the correct time. The leather watch pouch attached to his waist is beautifully detailed with brass. In Santa's other hand he holds an antique ivory hand carved pipe. Two horses are carved into this pipe, it is just beautiful. Anta is taking a look at his watch in order to make sure he is not late for that very important date! Star Catcher rests on his pedestal waiting to catch a shooting star. As you can see, he was lucky and caught two already! Stars are sculpted from epoxy clay as is the elf shoes, and the moon and sun attached to the pedestal base. The elf is sculpted from Cernit. 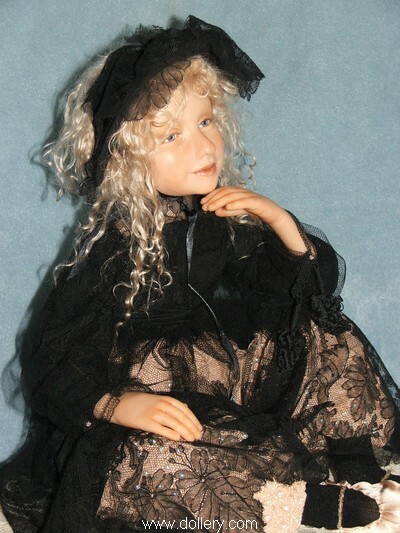 Blue eyes and blond angora mohair wig. 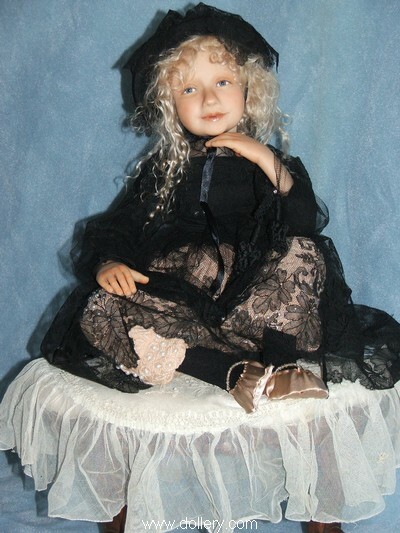 Dressed in black silk velvet lavished with silk ribbon embroidery on both his vest and elf hat. He wears very small crystals which I call moon dust scattered on his hat and face. The same crystals used in the stars for eyes and also decorations for the moon and sun. The pedestal is gold paper mache. The total size of this piece is 24 inches tall, including base. The elf in his "leap frog" (actually "leap star" since he is ready to catch the next one that passes by), position measures 12 1/2 inches. Buttons - One of a kind - Buttons, 18" in a sitting position. But entire piece is much bigger. He comes with a Singer sewing machine. Buttons has a very important job as the head elf in the sewing department. Created in Cernit by Audrey Swarz. Sewing away on his antique Singer sewing machine, Buttons can make an outfit for anyone. He wears his own vest that holds a hundred buttons, just in case someone is missing one of their own, he is prepared. He is wearing antique button up shoes (spats) in black and white. His clothing a mix of new and old. He has cloth body with wire armature. Planked look flooring along with all the thread and bobbins a sewing room should have. He is not attached to the stool. Button's is a charmer and can make any dream come true with the spin of his machine! For more photos of this Elf click here to review last on line show or click on photo but there are more on the on line show. 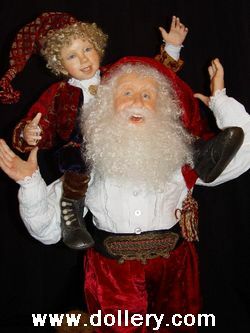 Similar sculpts and Santa's w/Elves may be special ordered. This was sold at our last 21st Anniversary doll show. Email kmalone@dollery.com for details on special ordering pieces. For more photos of this Santa go click here to review last on line show. This piece is really special! The picture is low resolution and does not do it justice. Email kmalone@dollery.com for high resolution photos! This is perfect for the collector who wants a piece from her but isn't completely into fantasy. 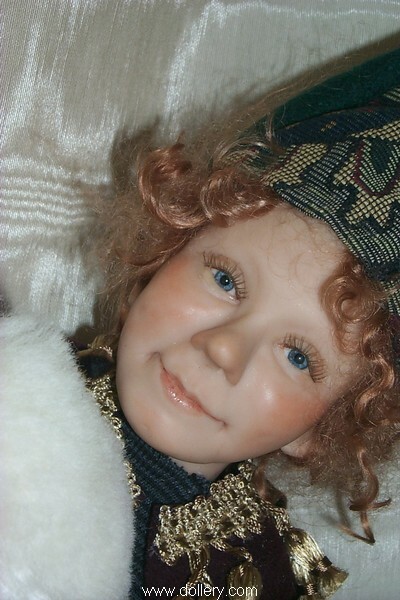 Polymer Clay, Brown hair, Blue eyes, 20 inches. A Fantasy lovers dream! All hand made by Audrey down to the fantasy tree base! This piece is really special! The picture is low resolution and does not do it justice. Email kmalone@dollery.com for a high resolution photo. Copyright The Dollery Inc. - All images are property of The Dollery and can not be taken off this site without permission.